Help ease the pain of teething by using a clean, cool washcloth to gently massage the gums. Offer the child a cool teething ring or a teething biscuit, if that is appropriate for the age of the child. Always supervise your child when using a teething biscuit because of the potential choking hazard. Talk to your doctor or dentist before using over-the-counter pain reducers or desensitizing gel. The first teeth that will appear are usually the lower incisors, commonly known as the two front teeth. By the age of three, children should have their complete set of 20 "pearly whites." 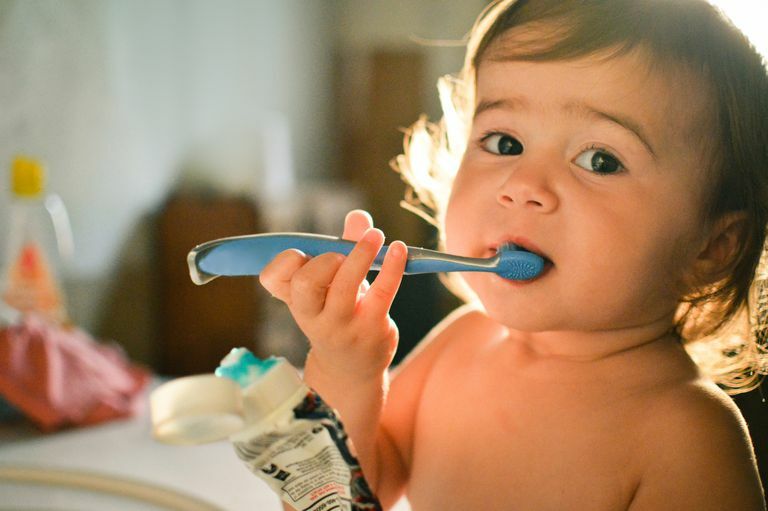 When the first teeth start to appear, buy a toothbrush designed for the age of your child, usually this is indicated on the packaging, and gently cleanse the entire tooth without toothpaste. Beginning at around 18 months, you may choose to introduce a tooth cleansing paste that is safe to swallow and does not contain fluoride. Many brands of children's toothpaste are available in your local retail store. When in doubt, ask the pharmacist to recommend a brand for you. Different types of baby toothbrushes are on the market; choose one that is right for you and your child. Speak with your dentist for advice on how to expose your child to fluoride, if it is not available through your water supply. Fluoride is recommended by the American Dental Association to strengthen teeth, which may prevent tooth decay. The American Dental Association. Oral Health Topics - "Early Childhood Tooth Decay (Baby Bottle Tooth Decay)"
The American Dental Association. Oral Health Topics - "Teething"
Vincent Iannelli, M.D., Verywell.com Guide to Pediatrics "Thrush- An Oral Yeast Infection"